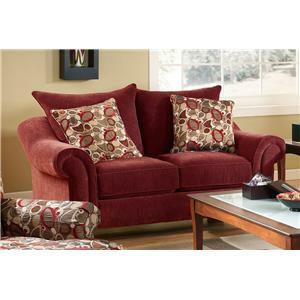 Snuggle up with a loved one in this ultra-comfortable loveseat. Perfect for any decor, enjoy the clean look of softly flared back pillows, rolled arms and amply stuffed cushions. Rich fabrics are accented by funky accent pillows, giving your decor a fun, Contemporary feel that everyone can enjoy! 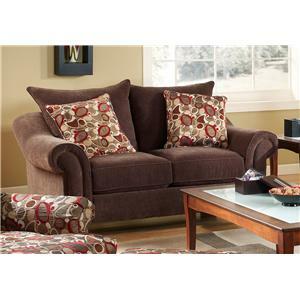 This reclining loveseat will offer you the comfort that you're looking for in a family room or entertainment space. This piece features a plush headrest and unbroken footrest with generously padded armrests. This reclining loveseat is also available in a manual recline option. 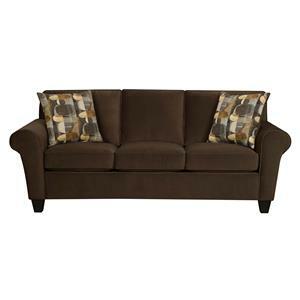 Use this casual styled sofa sleeper to add decoration to your living room at an affordable price point. 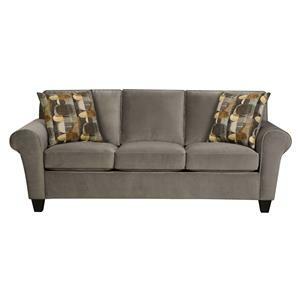 This three seat couch has a clean, tailored look that is enhanced with welt cord trim which gives a finishing touch. Style elements include rounded arms and exposed wood feet. Queen size sleeper mattress is hidden within. 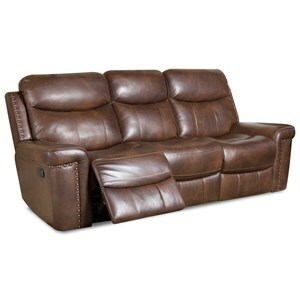 This recliner will offer you the comfort that you're looking for in a family room or entertainment space. 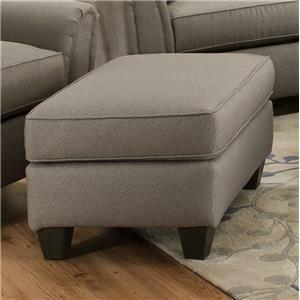 This piece features a plush headrest and unbroken footrest with generously padded armrests. 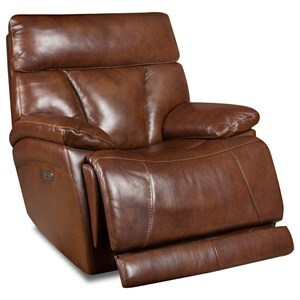 This recliner is also available in several power recline options. 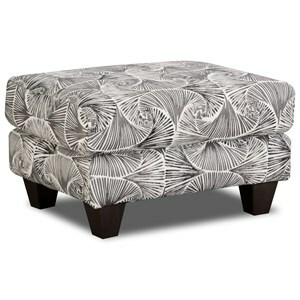 This ottoman complements the chair or sofa in your living room. Tapered feet give it a modern touch and the plush cushion gives it a relaxed, casual feel. Corinthian Furniture, Maker of Fine Furniture, specializes in offering a variety of stationary and motion seating groups of quality construction that will fit into any home's decor. Constructed of select hardwood frames, Dacron wrapped seat cushions with 1.8 density, premium spun fiber filled backs, no sag sinuous steel wire bases, Leggett and Platt mechanisms, and padded outside arms and backs, these features merge to create products that offer the utmost comfort and durability to withstand years of family use. Offering seating choices such as Corinthian chairs, Corinthian loveseats, Corinthian sofas, Corinthian sleepers, and Corinthian ottomans, it's easy to create a home full of functional and inviting seating arrangements. 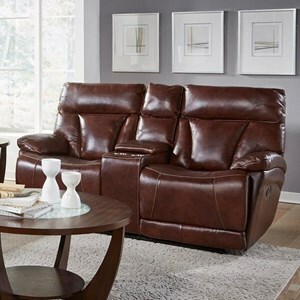 Further comfort and versatility comes in the form of rocker recliners, glider recliners, reclining love seats, press back chaises, and reclining sofas. Imagine sinking into the plush cushions of these items while you recline back and rest your feet without the aid of an ottoman. Corinthian also specializes in creating modular pieces that can be used alone or combined to make the sectional of your choice. Combine a Corinthian reclining love seat with console, corner wedge, and reclining sofa to create your very own theater seating experience! Most love seats feature consoles that allow you to store refreshing beverages, snacks, DVD collections, and TV or DVD player remotes so that you can control everything from the comfort of a Corinthian seat. The end result is a spacious seating solution for all your guests, friends, and family to enjoy. 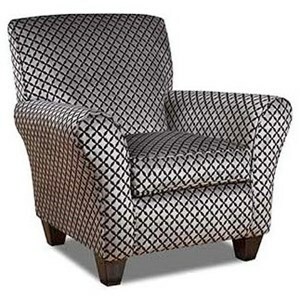 Corinthian upholstered furniture is not all about function and customization, though. No matter if it's your living room, sitting room, family room, entertainment room, home office, den, finished basement, or even your bedroom, Corinthian upholstery offers an array of exotic fabric options such as Nicoletta Cream/Focal Copper, Melrose Sandstone, Fabulous Mink/Firewall Ice, and Normandy Crimson/Chateux Crimson/Secretsilk. Corinthian living room furniture uses fabric from only premier mills to give products an upscale look at very competitive prices. Whether it's a casual, coastal, contemporary, cottage, traditional, transitional or mission atmosphere you're going for in your home's decor, Corinthian Furniture can help you decorate with its wide selection. Easily enhance your home with the contrasting, but complementary accent chairs, ottomans, and pillows. You don't need to be an interior designer to create a cohesive and functional seating group in your home with the variety of Corinthian.